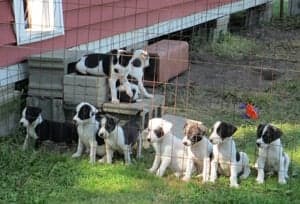 Unlike many rescues, Champlain Valley Canine Rescue will take in mother dogs with their litters and will take pregnant dogs and keep them until their puppies are ready to go to permanent homes. Lady (about 1 year old) came to us from a high kill shelter in South Carolina. She came with 9 puppies, about 5 weeks old, Border Collie/Australian Shepherd mixes (we think). 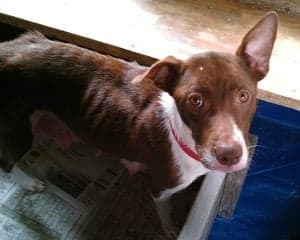 When this small family first appeared off the transport in Vermont, Tammy and I stood looking at the sad scene and discussed how many we would be able to keep alive; they were in very bad condition. Mom and pups were emaciated, flea bitten, Mom had hair loss and all showed every vertebra and rib! I set them up in a large kennel area with a fenced outdoor access on grass and started feeding Lady Libby carefully. Tammy wanted to call her Libby, but Lady knew her name, so we began to call her Lady Libby. She was very sweet natured, grateful for everything, exhausted by her large family. After a bit of rest, the pups were very excited about their new surroundings and in 15 minutes learned about the two steps they had to negotiate to get outside! They romped and played and Lady Libby rested. By the next day everyone looked much better! I couldn't believe it! They were still weak and slept a good deal but also enjoyed playing in the sun outside. I took Lady Libby out for a short walk with my three dogs and began to give her some time in the house away from the pups. A couple of days later my neighbor came over to see who the new arrivals were and brought her granddaughter, Charlotte (6). I watched Lady Libby carefully as the delighted little girl giggled over the puppies, sitting so they could crawl all over her and lick her face and untie her shoes. Lady Libby was delighted with the child herself! Not at all worried about the puppies! When the puppies where eight weeks old we photographed them, all bathed, fat and sassy. We listed them on petfinder.com. The applications flooded in and I began to pick wonderful homes. Within one week all the puppies were adopted and Lady Libby had become Libby. She was, if not exactly chubby, at least looking a bit more fit. She was enjoying two mile walks daily, lived in the house with us, and was feeling very playful and full of herself! We learned that she did not like to be left alone (insecurity from her ordeal) and would push out a screen, and jump out a window to get to me if I left her in. I didn't have a playmate in my pack for her, but Valerie did. Libby went to live with Valerie, a very experienced, dog savvy foster volunteer. Libby adjusted beautifully; but alas, there were no applications for her. Another month went by. Finally, there was an application for Libby! 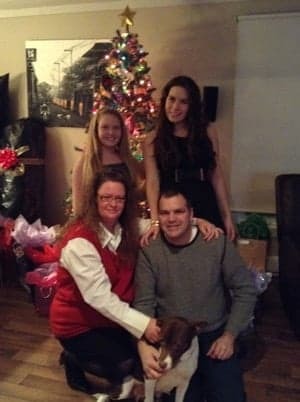 A family in Canada, with a stay-at-home Mom, who ran a day care in her home, needed a dog that was good with children, sweet and dependable. Libby had gained confidence by then and when she met her new family it was love at first sight! On both sides!! Libby now lives in Canada, a pampered family pet, keeping a close eye on her little charges and lovin' life! She and her nine pups were within 3 days of being euthanized. Why would they kill nine puppies? Because there are so many, they take a lot of time and space to maintain, and ALL new arrivals to the shelter only have so many days! Instead, Libby says "Mercy Bien!" and eight families have new babies to grow up with them (one family took two puppies). This is not an isolated story by any means; we take a number of Moms and pups each year....just what RESCUE is all about!